Life is full of surprising, joyful moments—moments worth remembering. 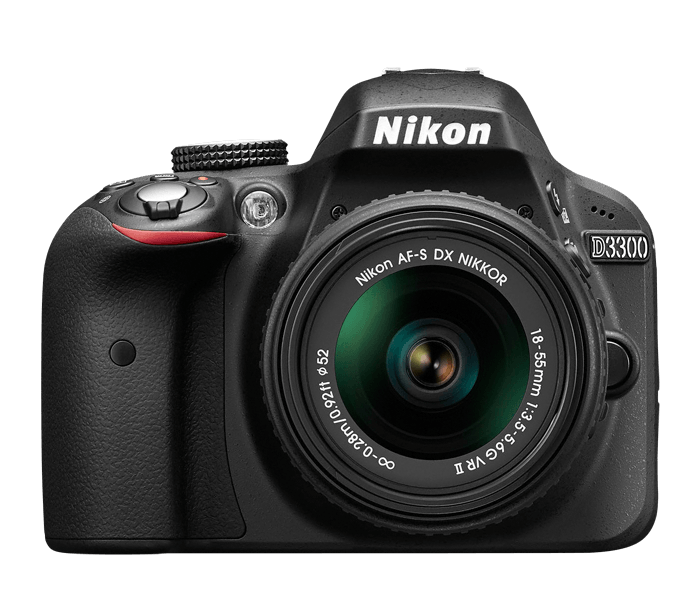 The D3300 makes it fun and easy to preserve those moments in the lifelike beauty they deserve: stunning 24.2-megapixel photos and 1080p Full HD videos with tack-sharp details, vibrant colours and softly blurred backgrounds. With its included zoom lens, the new ultra-compact AF-S DX NIKKOR 18-55mm f/3.5-5.6G VR II, the D3300 is a small and light HD-SLR and easy to use, too. Like sharing photos? The D3300 photos can appear instantly on your compatible smartphone or tablet for easy sharing with the optional WU-1a Wireless Adapter* (sold separately)! Whether you're creating high-resolution panoramas, adding artistic special effects or recording HD video with sound, the D3300 will bring you endless joy, excitement and memories—just like the special moments of your life. Taking snapshots with a smartphone is convenient, but are those photos good enough for preserving precious moments? The D3300's new EXPEED 4 lets you shoot at high speeds up to 5 frames per second, shoot in low light with high ISO sensitivity, create high-resolution panoramas and much more. Your 24.2-megapixel photos and 1080p Full HD videos will be so impressive, so rich with detail† and colour—so lifelike—they'll bring back the feelings of the moments they capture. Attach the optional WU-1a Wireless Adapter (sold separately) and marvel as the photos you take with the D3300 instantly appear on your compatible smartphone or tablet±. Share your favourite shots without missing a beat—text them, email them, upload them to your favourite social networking sites—it's your choice! You can even use your compatible smartphone or tablet as a remote monitor for the D3300. See what the camera sees and fire the shutter, perfect for self-portraits and group photos that actually include you. Using the D3300 is super easy—and a blast. Can't get the whole scene into your frame? Turn on Easy Panorama Mode and pan across the scene—the D3300 will capture the entire view as a high-resolution panoramic image. It's that easy! Guide Mode gives step-by-step help when you need it (it's like having an expert at your side), and you can easily get creative with built-in Image Effects, filters and more. 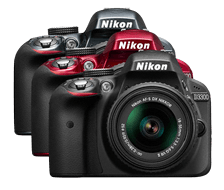 You even get to choose which colour you want for your D3300—black, grey or red! Like all HD-SLR cameras, the D3300 has an optical viewfinder that gives you a true view through the lens of the camera—and what a view it is! If you've been using a point-and-shoot camera, you'll find it easier to frame your shots, follow moving subjects, zoom in on bright sunny days and more. Make your photos even more impressive with the D3300's Retouch Menu. Easily crop in on your subject, alter the colouring, add special effects and more right in the camera—no additional software needed. Easily shoot in Black & White, enhance the intensity of colours, optimize the tones for flattering portraits and more with Picture Controls. Select one of 6 presets or create your own.